Ganz Schon Clever (Ganz to its friends) is an amazing game right up until the point you realise the fundamental flaws in its systems. Then it kind of dissipates with an unsatisfactory puff of disappointed potential. It’s basically like someone took my professional career and made a game out of it. No matter, even with that taken into account we were still willing to give it three and a half stars in our review. Provided you can stay ahead of the spoilers there’s no reason to believe you won’t spend many happy hours exploring its complicated internal interactions. Having done everything in our power to spoil the fun of those playing, let’s see if we can’t make amends by identifying those people that won’t be able to have their fun spoiled. Roll the dice, it’s teardown time. Predictably, colour blindness is a problem. 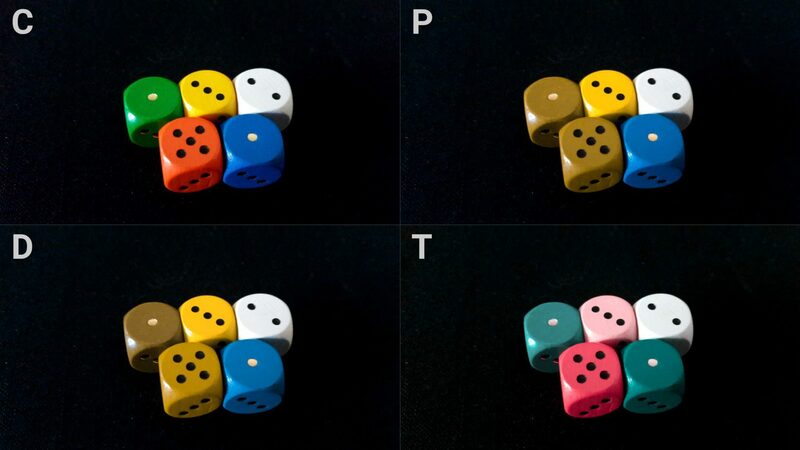 The dice are likely to be an issue for all the standard categories of colour blindness, although as usual the extent to which this is true will depend on the severity of the condition. Similarly, with the player sheets– the different sections are going to be an issue, but every part of it least a learnable location They don’t move around or change values like the dice will. 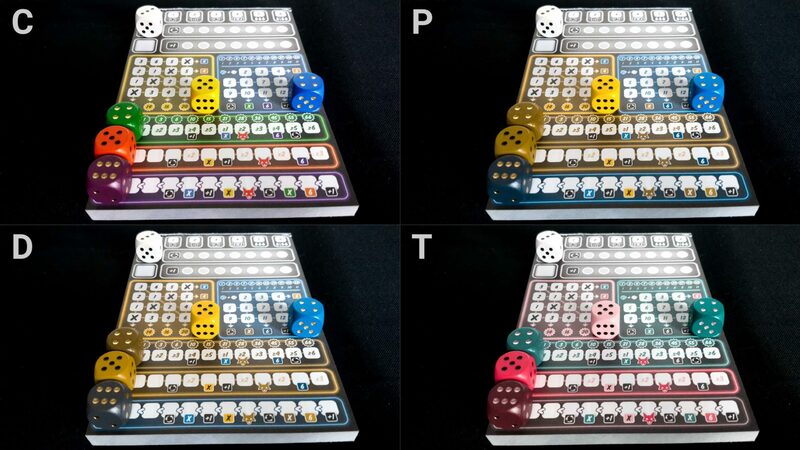 A subtler problem though is that the different hues on the dice and the sheets mean that you can’t even rely on mapping the colour of the dice to the colour of the section in circumstances where some degree of colour differentiation is possible. 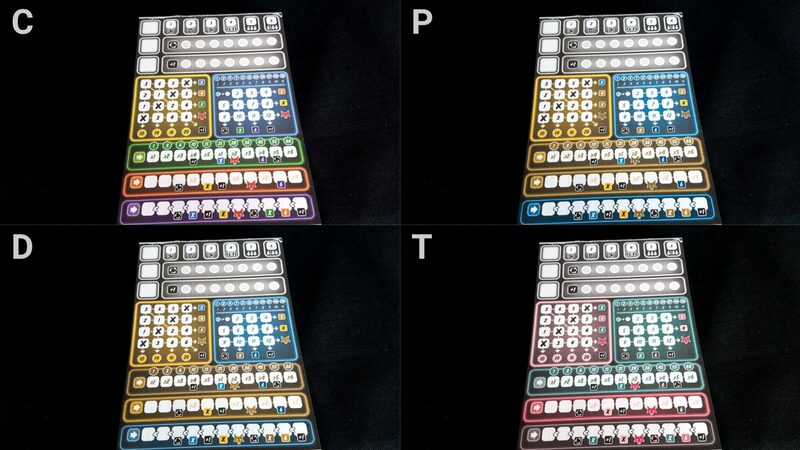 Consider for example players with Protanopia – the dice shown on this image are next to the right sections but you can see they don’t actually share a colour. It’s close, but not an exact match and arguably some of those dice look like they belong elsewhere. Now, at most there are six dice to be worrying about and there’s no real-time or covert activity. It’s possible to ask of the table, but this is also a game where carefully mentally curating your options is incredibly important. When you roll dice, you lose the ones with a lower value and some of those decisions are going to be based on the colour. You won’t really risk anything by asking people what colours of dice are at risk, but at the same time it’s hard to say that wouldn’t have a noticeable impact on the ease of play. We suspect Ganz is likely to be playable by people with colour blindness, but– it’s a 2018 game and there’s no excuse for this kind of thing. We were willing to be somewhat forgiving of Sagrada given that its theme was specifically and inextricably linked to the idea of translucent dice, but we have no such excuse here. We’ll very tentatively recommend it but ‘must do better’. 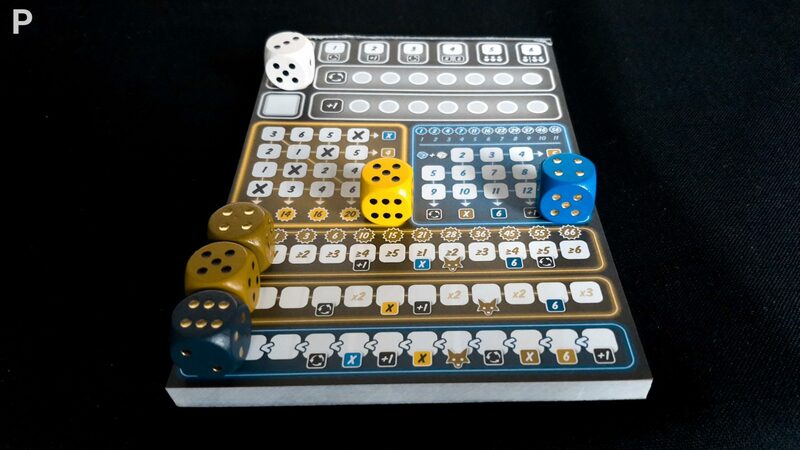 This is also a troublesome category because the sheets you use in Ganz are very information dense and the dice you work with are often linked in intricate ways that are difficult to verbalise. You can easily describe any section of Ganz Schon Clever but that doesn’t necessarily mean you can impart any sense of the subtlety. ‘Yes, you can place a blue two’ is useful guidance but what does that mean in practice? What synergies is it opening up? It’s not even enough to say ‘And that means if you get a ten you’ll get a bonus green’ because the value of getting that bonus is going to be linked to a whole pile of other things. Ideally you want that bonus when the next space to be filled is a five (because that’s the hardest one) or when it gives you a suitable chain bonus. Suitable though is dependent on every other part of the sheet. No point getting a free yellow if you’ve already filled that section, as an example. Close inspection of sheets is certainly going to be possible, but that analysis is a bit like a numerical word jumble – you’re looking not just at individual cells but how they relate to other cells and occasionally how those relationships intersect with other sections. For all that information density though, good contrast is employed (mostly) throughout. The exception is in the multipliers for the orange dice, but there is a pattern that can help with that and there’s nothing to say that it couldn’t be emphasised with ornamentation. After all, this is a roll and write. No reason at all you can’t doodle with the aim of increasing accessibility. The dice are standard d6s and while they’d be possible to replace with accessible variants they have colour information that needs to be retained. You’d also need six separate dice which is quite a lot to expect. The issue discussed above too is important here if using the set provided. Sighted players can tell others what they have available but what does that actually mean? A point I made in the review is that this is the roll and write equivalent of the Three Body Problem – where every oscillation of the game state throws everything in a new and unpredictable direction. Some of those directions are going to come from non-obvious influences and not being able to relate dice to sheet is going to result in them being missed. There’s no guarantee they’d be noticed under the best circumstances, but here you’re pretty much guaranteed they won’t be and that’s a problem. 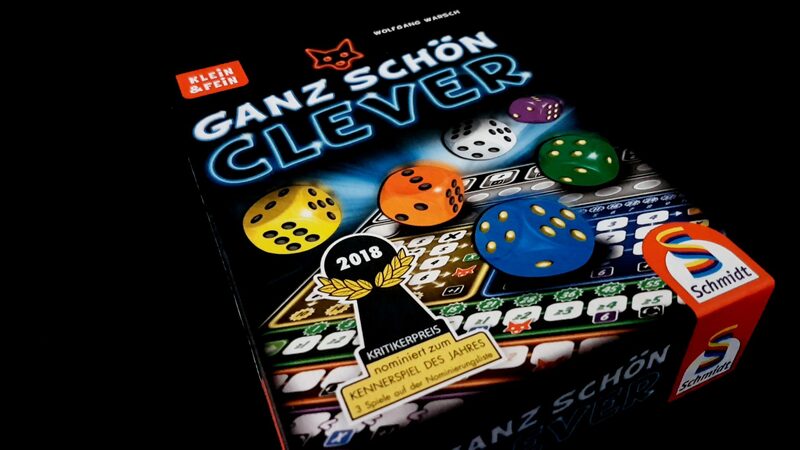 We don’t recommend Ganz Schon Clever in this category – while people with visual impairments will likely be able to play, playing well is going to be a much more difficult ask. There’s a lot going on here, and all of it stresses cognitive faculties. For example, there’s a lot of numeracy. A lot and the complexity of how it all works is likely to present a significant barrier to many players. For example, the value of a fox depends on your lowest scoring category which means even knowing how many points you have, or even a ballpark figure, is often complex. For a game that is entirely score driven that can be a problem. 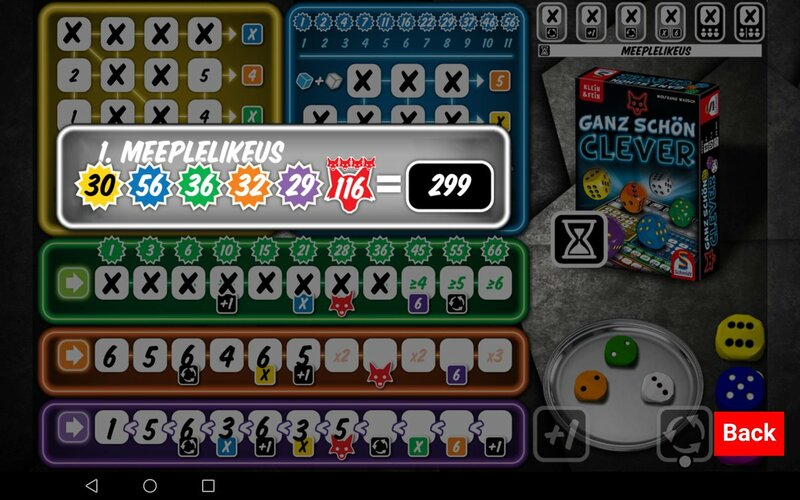 This situation shown below was SO FRUSTRATING because one different die placement would have got me passed the 300. Part of the issue here is that the expectations of numeracy are, on the surface, shallow – comparisons of numbers, addition, seriation and so on. The way these numbers all relate though is really intricate and the value of a dice is not at all obvious on the surface. The time to use rerolls and extra dice depends on a shifting sense of worth – a green five when that’s what you need is worth its weight in gold unless it means sacrificing the white one that gets you a bonus square. Often you’re choosing between multiple dice, each of which you desperately want. You then need to take into account the probability of replicating needed dice on subsequent rolls. On a purely statistical level, is it better to get the white six or the blue one? Probably the white six, because the blue one is at least reasonably likely to be left in the tray by other players as time goes by. However, the simple fact you want it might change that equation, which changes the risk, which changes the value of everything else once more. Every turn of Ganz needs you to do something good with your dice but is less clear about what good even means. 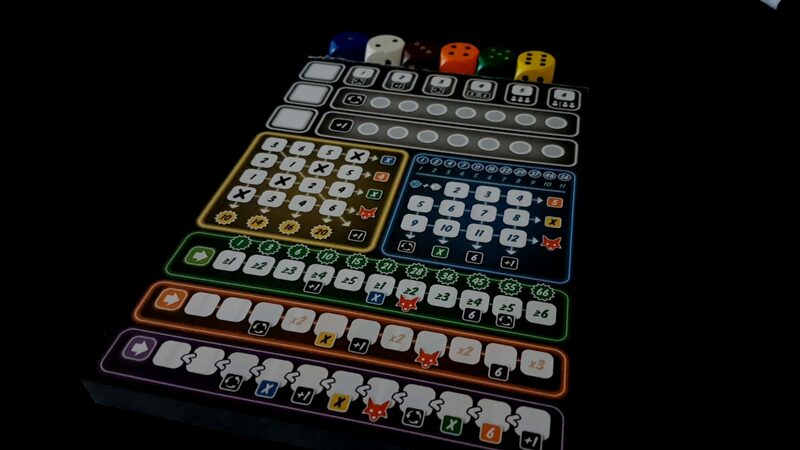 Coupled to this is a need to ‘hold back’ dice so that you have spaces for bonuses. There are three bonuses that will give you a blue square. Three that will give you a yellow square. Three that give you a green square but one of them is very far down the purple path. Three bonuses that give you a purple, but one is very deep down the orange path and one is almost as deep down the green path. That means that even the availability of bonuses has to be weighed against the value of dice and the probability of getting results you can use at all. You can lose yourself in this puzzle if you try to approach it as a task of optimisation. The problem is – you have to do that to win. The game does offer a little bit of a get out clause by offering a series of evaluations on score – less than 140 is ‘try harder’ whereas more than 280 is ‘you’re so clever’. It adopts a genial, generous tone with that. 240 will get you ‘what a genius’, as an example. However, in the end this is a game about getting a great score and you need to use those dice well. You need to use them with precision while also giving yourself room to recover from poor rolls. The scoring conditions for each different section aren’t onerous, but they are also non-intuitive and lack any real documentation outside of the rules. Yellow scores in a different way from blue and green, which in turn score differently from orange and purple. Orange and purple have no indicators that would suggest their scoring is summative rather than by number of filled sections. It’s not a critical problem but it is a touch obtuse. Game flow can be intensely complex because of the way chained bonuses work, and those chains might be compound – you might for example trigger two bonuses that then each trigger two further bonuses and more. The consequence of playing a single die might be to fill in a single space or might be to enable a half dozen squares to be completed in short order. Being able to leverage this at the best time is important, as is using the additional die claims that you can pick up over the course of the game. It’s always going to be a case that you roll dice three times and pick three (assuming you don’t lose all your dice before that happens) but what you do with each die can differ dramatically. That’s all bound up in a context of enabling and utilising powerful synergies that create bifurcating courses of action. You play a dice, it gives you two bonuses. You play the first bonus and it gives you two more. It’s easy to lose yourself in the evaluation and enacting that this stack of actions creates especially since the order in which you take actions might in itself be significant. It’s also easier than I would like to lose yourself in turn order, because each player has one shot at being the ‘active’ player and then everyone takes a die at the end as a ‘passive’ bonus. Games of Ganz are quite short though and it’s easy if you’re playing a few games back to back to forget who started and who ends a turn because you’re all interleaving taking dice. You can make a note of this somewhere it’s still some extra state tracking that can get away from people. Turns can blend into each other if people aren’t diligent. 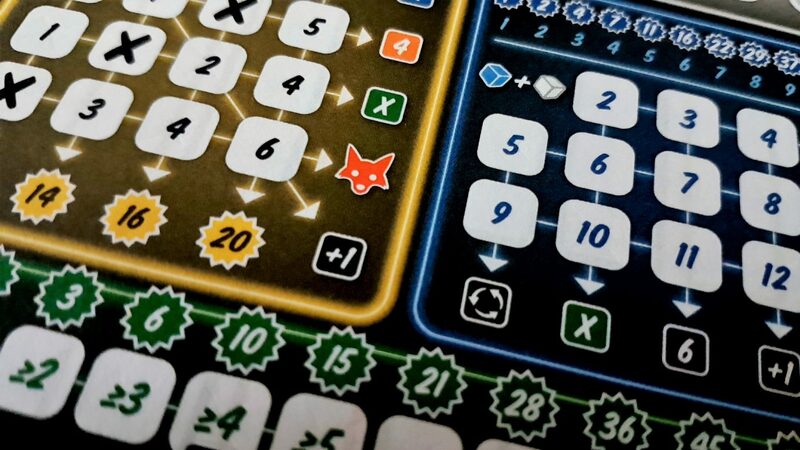 The cognitively accessible variant of Ganz Schon Clever would perhaps avoid the competitive aspect and work instead to build a collaborative score – that way it doesn’t hugely matter about making ideal use of synergies because the team as a whole can compensate for other players. I think this might even be interesting in and of itself because it lends a new challenge to the passive dice section – normally you pass on a series of awful, terrible dice that you didn’t want but if you were looking to maximise a shared score (or perhaps maximise a single score) it would become a different kind of assessment. We tentatively recommend Ganz Schon Clever in both of our categories of cognitive accessibility on the basis of there being a (semi) cognitively accessible variant that sounds kind of fun. As usual though, that’s entirely theoretical. The largest issue here is that of frustrated ambition – I got drawn in deep here and most of that was in a self-inflicted purgatory of trying to accomplish an arbitrary score I had personally deemed to be important. The randomness in Ganz is significant and it’s possible for someone to lose, and lose badly, just because the dice didn’t go their way. Score disparity can be very high between players but also very high between Current You and Past You. It creates a weird feeling on occasion that you’re getting worse because it’s more complicated than ‘I rolled low numbers’. Low numbers are occasionally as valuable as large numbers here. It cuts away the obvious link between familiarity and competence. Those with obsessive tendencies may find that being unable to make progress in sections is an issue, because realistically you are always going to have holes in your pattern. You can’t ever compete every section and you’re heavily incentivised to partially complete all of them by virtue of the fox icons. If there is a compulsive need for completion for someone at the table that’s likely to be aggravating. However, other than this Ganz is a reasonably toothless game. It’s highly abstract. There’s no way for players to undermine other players except by leaving them poor dice on the platter. Even doing that intentionally is likely to come at a personal cost. Players never get knocked out of the game but if they play poorly, leaving themselves with unplaceable dice for example, they can well be kicked out of contention. Every die here is unspeakably valuable and losing one, or more, will almost certainly result in you losing the game. That’s important too because your mistakes here are permanent – you write them into the sheet with a marker and you can’t ever change them. Sometimes that can be to your detriment – for example, if you place a purple five you are making it very difficult, barring the availability of a convenient bonus, to place the next die. On the other hand, playing a small number there can seem like a waste in a category that has a summative score. Essentially you just need to resign yourself to rolling with the dice and living with the consequences. That at least is an issue baked into the nature of a roll and write game and anyone sitting down to play will presumably have some sense of into what they’re getting themselves. There are some problematic things to consider here but they’re not emphasised enough in the design to be deal-breakers. 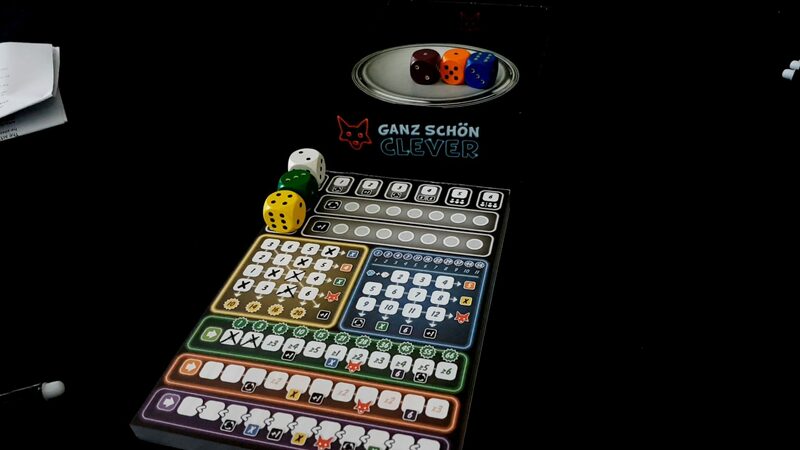 We’ll recommend Ganz Schon Clever in this category. All of these can be actioned on behalf of a physically impaired player, and while that seems like it’s all of the game it’s not really where the fun is. The fun is in working out what to do with the roll fate gave you. All actions a player needs to take there can be unambiguously verbalised. The only place where there’s even a slight complication there is in the yellow section where each die might have two possible places it can go. It’s a 4×4 grid though and it’s easy to indicate a location with row and column. We’ll recommend Ganz Schon Clever in this category. Ganz Schon Clever is entirely abstract, and none of the art in the game is human. I have the German edition and the seller was kind enough to print out the English translation of the rules from BGG and send it my way. That translation does default to masculinity but I don’t know enough German to know if that’s an issue in the actual manual. I guess I’ll find out when the English edition is actually published. In the meantime I can’t hold an unofficial translation against a game and my lack of education prevents me from making a judgement on the actual rules. Ganz has an RRP of £13, and honestly until you find the winning strategy you will get hours and hours and hours of fun out of it. It has a rock-solid solo mode that I maybe even prefer to playing with real people. The app version, while as ropey as a big rope, is fantastic value for money. I can’t remember the last time a game gave me anything approaching this return on my investment. It only plays up to four players but each game is short enough that you could easily do it pool hall style with winners playing off against everyone else. Or just buy two sets and bang them together. We strongly recommend Ganz Schon Clever in this category, although we reserve the right to adjust its grade when the English edition is actually released. I mean, we always reserve the right to adjust grades for any reason at all, up to and including being in a bad mood, but you know – there’s a real chance this grade will harden a little. While Ganz Schon Clever does stress numeracy and familiarity with Arabic numerals it doesn’t otherwise require any communication. The version I have is German and once you learn the rules it doesn’t make a bit of difference. We strongly recommend it in this category. Our colour blindness recommendation is already as tentative as it can be within our framework, and if it were to intersect with any cognitive impairments it would invalidate those grades across the board. It’s too finely balanced in each of those categories to survive even a mild push. Otherwise there are no real significant intersections I can see. Games of Ganz Schon Clever are very brisk – about 20 minutes or so barring accessibility considerations. It’s reasonably resistant to players dropping out, right down back into solo mode, because the only role other players have in a turn is to take a passive die. Nobody locks up resources. However, the round limit is supposed to change based on player count and a player dropping away is going to have an impact. You can house rule any number of satisfying ways to resolve that. It’s short enough to fit around conditions of modulating severity, low-impact enough to be suitable for a wide variety of circumstances, and even has a small enough footprint that it could be played in a wide range of locations. It fits well into the cracks of life. Ganz Schon Clever comes out of this a little bruised, but not to the point anyone should throw in the towel. A lot of our recommendations though are tentative and as always readers should form their own conclusions based on the text of the teardown. It really does frustrate me though that a game released in 2018 still has such scant disregard for colour blindness. While a colour blind sensitive palette doesn’t guarantee accessibility it does make things considerably better and there’s not even a thematic reason as to why it hasn’t been considered here. Come on, publishers. Do better. We liked Ganz Schon Clever considerably more than our rating might imply – at least, for a while. Unfortunately, we had a strategic epiphany that basically turned it into a loot box generator and that soured us considerably – especially since that strategy is straightforward enough to be frictionless in transference. Until that happened though we were very happy with it and if you can avoid the spoilers you will find this a very worthwhile use of your time presuming its accessibility profile is compatible with your needs.